What makes an ordinary hamburger patty into a tasty Biff-Burger? Why, the "Roto-Broiler" of course! The patented stainless steel constructed Roto-Red R-22 Broiler, (see notes below), utilizes infra-red heat technology consisting of several glowing heating elements, one above and below each of the two circular racks. This infra-heat, similar to the heat radiated from glowing quartz tubes in space heaters, is used to broil and toasts each sandwich exactly the same into a delicious tasting juicy Biff Burger. According to the National Biff-Burger System's Franchise Opportunity booklet, the capacity of the Roto-Red is rated at over 500 uniformly broiled hamburgers and toasted buns per hour. Flavorful juices are retained in the burger by broiling both sides of the meat simultaneously. Any drippings are caught by the toasting buns placed on the bottom rack beneath the burgers, catching the entire flavor of the sandwich. The bun rack is adjustable to toast buns as desired. After a few minutes, the cooked 100% beef burgers and toasted sesame seeded buns came out the other side of the covered broiler and ready for dipping into Biff-Burgers special sauce. The "Special Sauce", another signature of Biff-Burger, was warmed in a warming pan adjacent to and to the left of the roto-broiler. 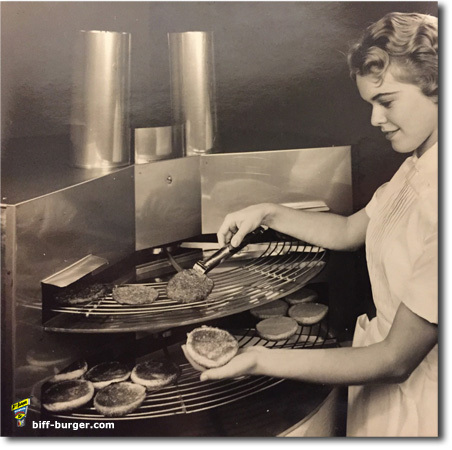 When the burgers were taking out of the roto-broiler, each burger was then dipped into the sauce warming pan whereby coating the burger with Biff-Burger's signature special tangy sauce, made of 27 spices, before being placed between two buns and fixings added. The photo on the right, provided by D. K. Brane, is believed to be of the proto-type or "first" Roto-Broiler being tested in Largo, Fl around 1958. It is unknown if roto-broilers produced for the drive-in locations were of this "V"-shaped design with double exhaust tubes or if the style pictured in the right photo was of the design that became the final design. However, based on the broiler apparatus design submited to the U.S. Patent Office by Earl P. Brane, it is highly probable that the design pictured in the left photo is indeed of a proto-type and the photo on the right is of the final patented design. The broiler apparatus, invented by Earl P. Brane, submitted to the United States Patent Office, dated September 16, 1957, Serial No. 684,131, and patented on January 5, 1960, Patent No. 2,920,177, is very similar in detail to that used by Beef Burger in North Carolina. 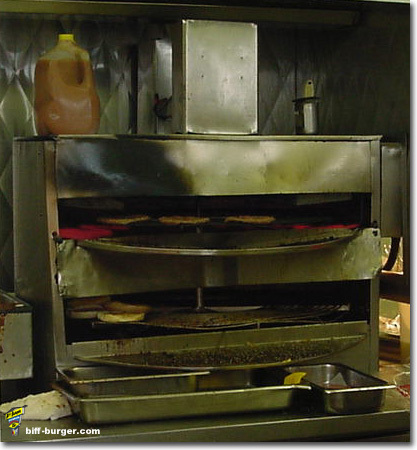 The photo on the left is of an original Roto-Broiler still used today at Beef Burger in Greensboro, NC, which was formerly called Biff-Burger (see Beef Burger). This photo is an excellent example showing 3 burgers placed on the top rack and a few buns on the bottom bun rack. Note the glowing infra-red heating elements, noticeable on the left and right hand side of the broiler. A gallon of special sauce, claimed by Ralph Havis, the owner of Beef Burger, to be based from the original recipe, is sitting ontop of the broiler. A portion of the sauce warming pan is noticeable just to the left of the broiler. WOW.... I can just taste those juicy burgers!